After graduating from Ohio University with B.S and M.S (pre-med and education) degrees, Dr. May Trieu pursued her medical education (studied western medicine) at SABA University, School of Medicine. Western medicines are not really treating the source of disorders. To better treat the source of her patients’ illnesses (not the symptoms) Dr. May Trieu decided to enroll in school to study eastern medicine which involve bodies' wellness. She started to gain knowledge at the acupuncture school in Dallas, TX. Always eager to learn more, Dr. May Trieu went to Vietnam (her birth place) to study more in depth. There, she was very happy to achieve a post doctorate degree in acupuncture and oriental medicine, including acupuncture, herbal remedies, nutrition, meditations, and acupressure at the medical school in Ho Chi Minh city, Vietnam. Before returning to the U.S., she was grateful to be able to go to some Buddhist temples to learn the secrets of Buddhist acupuncture from the master monks. 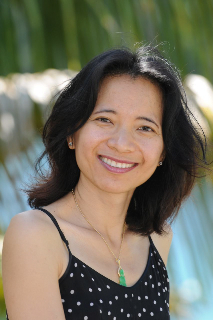 Dr. May Trieu has chosen the beautiful island of St. Thomas to open her practice. She is fully dedicated to promote the power of natural healing of the most ancient medicine. She strongly believes in Balancing Body, Mind and Spirit. Dr. May Trieu has been practicing Holistic medicine in St. Thomas, U.S.V.I. for more than ten years. Currently, Dr. May Trieu is also the co-founder of the Nirvana Temple in St. Thomas. Her goal is to offer the best treatments of True Healing to all patients. At the Nirvana Temple, she has created one of the best professional services in a true healing location for all. Any treatments done at the Nirvana Temple are karmic experiences. All proceeds or profits will go toward the temple's maintenance and charities works.